In Facebook you see links that your friends have shared with you and this should make these links more relevant to you. Other links come from pages and groups that you have joined indicating you positive attitude towards those brands, people, etc. This was confirmed by a recent study. 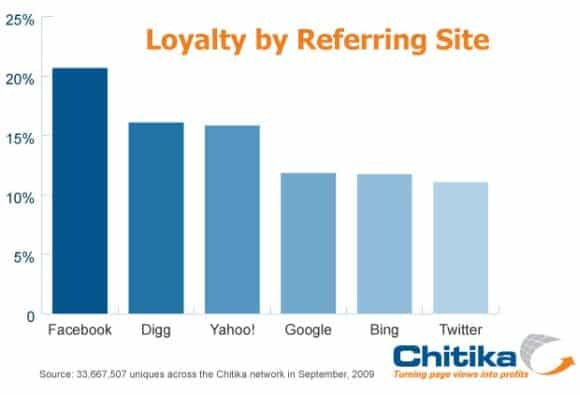 Facebook and Digg are driving the most repeat readers according to a study conducted by online ad network Chitika. The study was based on 33 million unique users across Chitikas publisher network in September. It compared the number of visitors coming from major traffic sources Digg, Facebook, Google, Yahoo, Bing, and Twitter, to the number of times those visitors came back to the referred site. Visitors that went to a site four or more times in one week were considered loyal users. via The Most Loyal Traffic Comes from Facebook | WebProNews.